Believe it or not, there are still people out there - engineers and hobbyists - who design circuits using discrete transistors. Sure, there is a plethora of integrated circuits that combine multiple functions into a single package that performs often nearly like ideal components, and for a lot less money than building an equivalent circuit from individual components. Still, sometimes a lone transistor with a couple biasing resistors will do the job, and sometimes the designer just wants to do something different. There are also plenty of instances where you need to find a replacement of a failed transistor that has similar form, fit, and function. 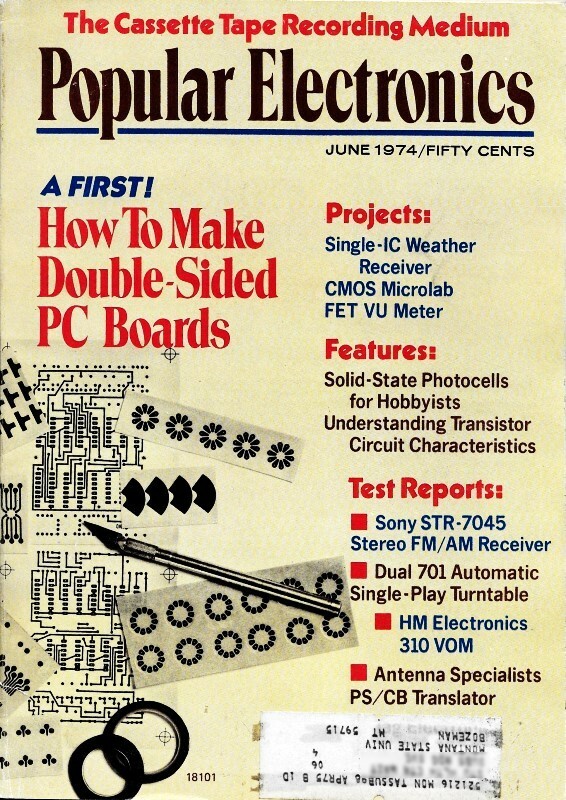 This article from a 1974 issue of Popular Electronics might be just the aid you need if you have found yourself in need of selecting a transistor. Of course if your application is for high frequency, there are parameters to consider other than those presented here, but it's a good start. Fig. 1. 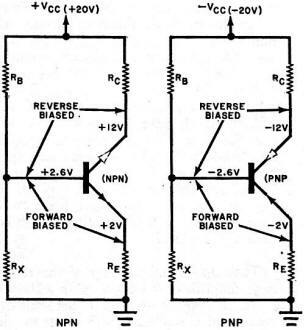 - Reverse and forward biasing requirements are shown for npn and pnp transistors. Selecting a transistor for a specific circuit application involves considerably more than just picking a device at random and using trial and error to determine whether or not it will work. Proper device selection requires that the ratings and parameters of a transistor be known and that the importance of these characteristics in the application be understood. 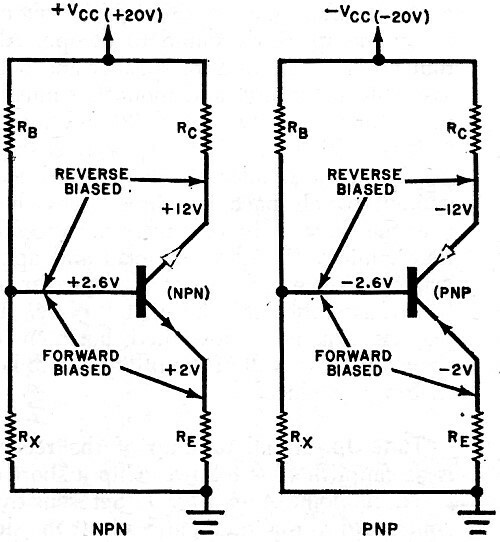 As readers doubtlessly know, the bipolar transistor is normally forward biased from base to emitter and reverse biased from base to collector (Fig. 1). In the active mode of operation for the transistor, a small change in base current, IB, results in a much larger change in collector current, IC. Transistors also have two other modes of operation - cut off and saturated. In the cut-off mode, only leakage current flows through the transistor. In the saturated mode, maximum current flows, limited only by the external components. Even though we use a transistor primarily in the active mode, we can illustrate many parameters much more clearly by considering the cut-off and saturated modes. Parameters and Characteristics. Here are ten transistor characteristics that should be taken into account when a device is being selected (or when a circuit is being designed around it). Refer to the proper drawings in Fig. 2 for pictorial definitions of the parameters. (1) VCBO: This is the collector-to-base breakdown voltage in the reverse-bias condition. If the collector-to-base voltage is allowed to exceed the breakdown value, the transistor may be destroyed. Always select a transistor whose VCBO rating exceeds the highest voltage expected to exist in the cir­cuit between the base and collector. Fig. 2. - Transistor is shown cut off (A), saturated (B), and in normal mode (C). 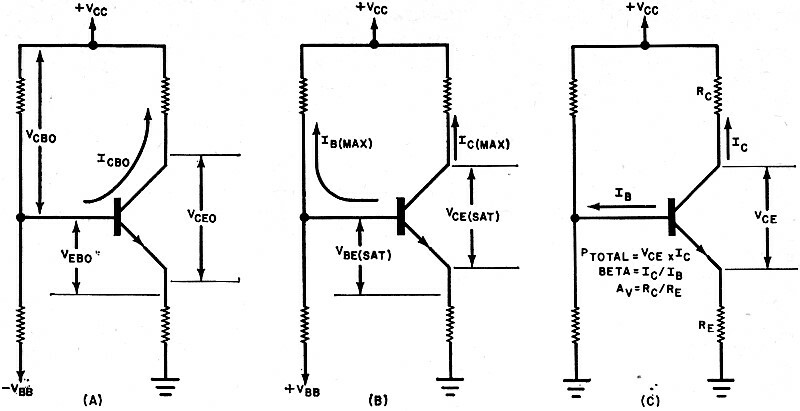 (3) VCEO: This is the maximum allowable voltage from collector to emitter with the transistor reverse biased (cut off). The VCEO of the transistor should exceed the power supply voltage if the transistor is to operate safely. Alternatively, the supply voltage for the circuit should be maintained at less than the VCEO. (5) VCE(SAT): This is the voltage from collector to emitter when the transistor is conducting maximum current and further increase in base current will result in no further increase in collector current. This voltage is the minimum potential that must be maintained between emitter and collector if transistor action is to continue. It is usually specified as a specific current, IC(SAT), and should not exceed the power supply voltage minus the peak-to-peak expected collector voltage swing. 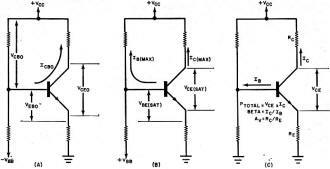 (6) VBE(SAT): This is the base-to-emitter voltage when the transistor is saturated. It is usually specified at a specific current, IB(SAT), and is important primarily in switching circuits, although it does affect the biasing of analog circuits. (7) IB(MAX): This is the absolute maximum base current that can safely flow into the transistor. Care must be taken to insure that the circuit will not cause base current in excess of IB(MAX) to flow, and, conversely, the IB(MAX) rating of a device must always exceed the maximum expected base current. (8) IC(MAX): This is the absolute maximum collector current that can safely flow in the transistor. If it is exceeded, the device is likely to destruct. The IC(MAX) rating should exceed the maximum value of collector current that can ever flow in the circuit. (9) P(TOTAL): The total (maximum) power that a transistor can safely dissipate should never be exceeded. The actual power in a circuit is equal to VCE X IC when the transistor is biased in the active mode. (The base-emitter voltage and current also contribute to total power, but they are usually negligible with respect to VCE X IC.) In most circuits, it is wise to choose a device whose P(TOTAL). rating is 2 (VCE X IC ). Fig. - 3. This diagram shows how the various parameters are used in designing a circuit. 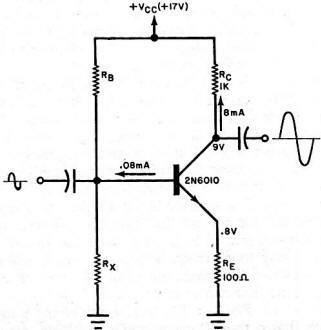 (10) HFE This is the current gain of the transistor when in the common-emitter configuration (shown in Figs. 1-3) and is usually referred to as the transistor's beta (β). Beta is defined as the ratio of collector current to base current (β = IC//IB) and is one of the most important of a transistor's parameters. It determines the achievable circuit gain and the required biasing resistor values. It might be specified as a range of values (10 to 100) or as a set of values at specific collector currents (50 @ 1 mA, 20 @ 10 mA, etc.). To select a beta value for a given transistor, calculate the value of collector current required in the circuit and the base current available. In any circuit like that shown in Fig. 2C, beta must exceed the ratio RC/RE but must not be so large as to allow the transistor to saturate. In a new design, the minimum beta is the most critical parameter, since the biasing can be tailored for any specific value. Using The Parameters. The circuit shown in Fig. 3 should help in tying together all of the seemingly unrelated parameters. With this circuit, we will illustrate an actual design procedure and demonstrate how each parameter relates to the design. There will be 12 volts peak-to-peak across RC and 1.2 volts p-p across RE. So that VCE(SAT) does not affect the circuit, add 3 or 4 more volts to the required total potential from the power supply. Make VCC equal to 12 + 1.2 + 3.8, or 17 volts. With a VCC supply voltage of 17 volts and RC + RE equal to 1100 ohms, the maximum collector current will be 17 volts/1100 ohms, or 15.45 mA. With the transistor properly biased, there will be about half of this value (about 8 mA) of collector current. VCE will be 17 volts - (8 mA X 1100 ohms) = 8.2 volts. Total circuit power, then, is 8.2 volts X 8 mA = 65.6mW. VCE(SAT) and VBE(SAT) are not critical; IB(MAX) = IC(MAX)/Beta. A comparison of these characteristics with our circuit requirements reveals that the 2N6010 transistor will more than adequate­ly met our needs. All that is necessary now is to compute the correct values of RB and RX using conventional means, and to check out the circuit. 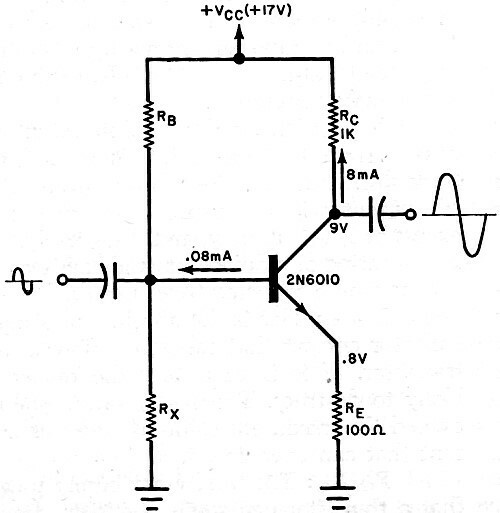 There is a lot of leeway in the selection of a proper transistor for a circuit. The more conservatively rated the transistor is for a specific application, the better the probability of the circuit operating almost forever. When it is necessary to select a replacement transistor, just analyze the circuit for its important parameters and select a new device whose characteristics fit the requirements.